MAXIOS (GB) stands in Germany at Andreas Jacobs’ Stiftung Gestüt Fährhof. 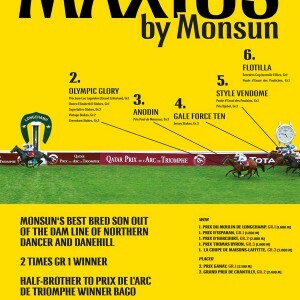 Maxios is Monsun’s best bred son at stud and is from the family of NORTHERN DANCER and DANEHILL. 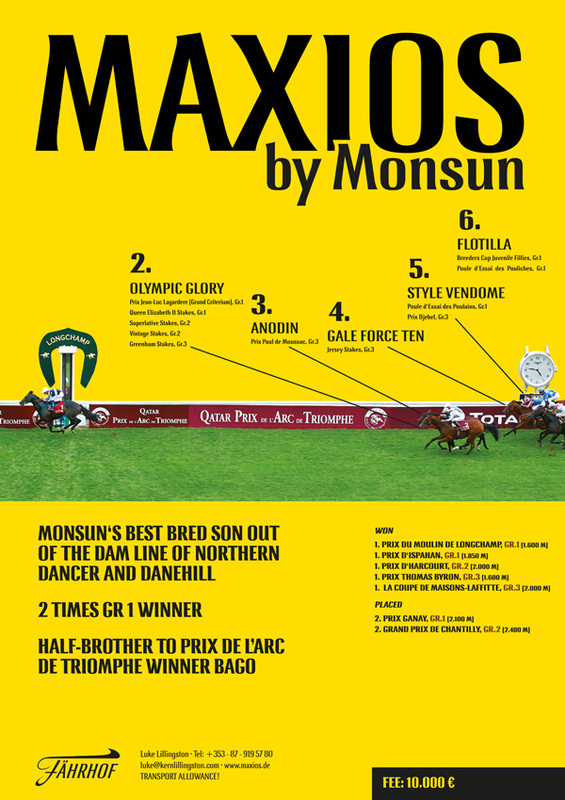 MAXIOS is also half-brother to European Champion, BAGO, winner of the Juddmonte Grand Prix de Paris G1, Prix de l’Arc de Triomphe G1, Prix Ganay G1, Prix Jean Prat G1, Criterium International G1 and Prix des Chenes G3, etc. Won 8 races; placed 2nd twice, £585,690. WON Prix d’Ispahan G1 1850m by 0,5 lengths from Planteur and Mandour. WON Prix du Moulin de Longchamp G1 1600m by 5 lengths from Olympic Glory and Anodin. WON Prix d’Harcourt G2 2000m by 0,75 lengths from Don Bosco and Saga Dream. WON La Coupe de Maisons-Laffitte G3 2000m by 1,5 lengths from Reliable Man and Saga Dream. WON Prix Thomas Bryon (2yo) G3 1600m by a head from Private Jet and Grand Vent. 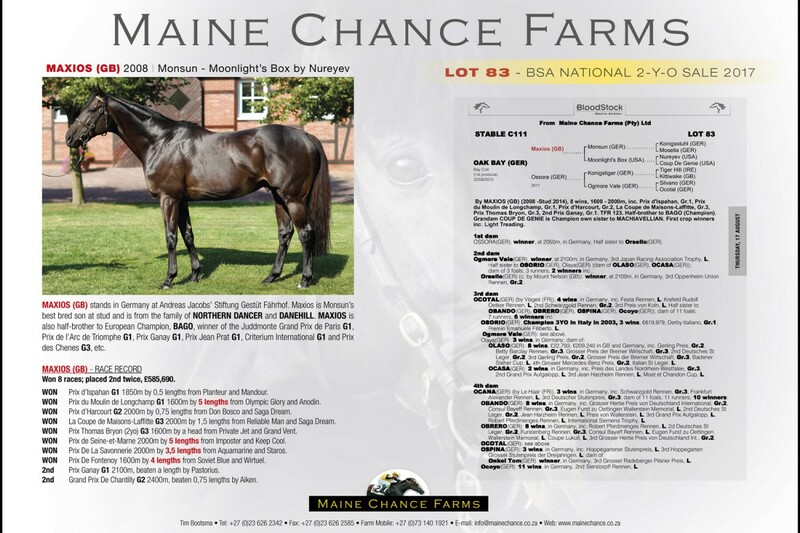 WON Prix de Seine-et-Marne 2000m by 5 lengths from Imposter and Keep Cool. WON Prix De La Savonnerie 2000m by 3,5 lengths from Aquamarine and Staros. WON Prix De Fontenoy 1600m by 4 lengths from Soviet Blue and Wirtuel. 2nd Prix Ganay G1 2100m, beaten a length by Pastorius. 2nd Grand Prix De Chantilly G2 2400m, beaten 0,75 lengths by Aiken.